Opposition Leader David Granger said that the matter of public safety does not rest solely with the people of Guyana; it is a matter for those who were appointed to ensure the safety of Guyanese. 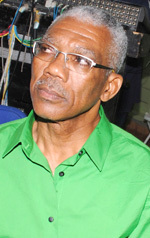 Granger was responding in an invited comment to this newspaper on the advice given by Commissioner of Police Leroy Brumell when he met with members of the West Coast Demerara community of Meter-Meer-Zorg, following a spate of criminal activities that took place there within a matter of days. Brumell had urged the residents not to hide and remain fearful, but to defend their families and the merchandise that they had worked so hard to attain. He urged too that licensed firearm holders should also look out for their neighbours, adding that reports can be made against licensed firearm holders who might refuse to intervene in a matter despite their neighbour being in danger. Granger told Kaieteur News that he is not keen on the idea of citizens putting themselves in harm’s way. The Opposition Leader said that there are many mechanisms that the government refuses to put in place to manage the escalation of crime and to strengthen the agencies tasked with fighting it. Granger said that unless the government takes meaningful steps towards ensuring the safety of citizens, security will always be a matter of grave concern. A little over two weeks ago, the son of a high ranking member of the Central Islamic Organisation Guyana (CIOG) was gunned down by a gang of criminals during a robbery at his home at Meten-Meer-Zorg. A few days later, persons believed to be from the said gang of criminals were involved in a shootout with policemen, resulting in the death of one of the gang members. They were allegedly planning another robbery in the community. The gang was however said to be dismantled and several persons are currently before the court charged with murder. This turn of events had left the usually quiet, farming community in a state of shock and overwhelming fear; to which the Top Cop felt he should make an appearance to tell community members personally that they were once again safe and the police had not abandoned them.